What Do You Do with a Million Books? 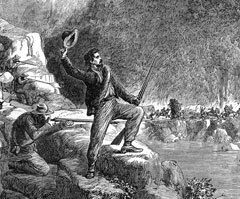 Illustration of Longstreet's Sharpshooters attacking a federal train above Chattanooga. Courtesy Perseus Digital Library, Tufts University. Used with permission. the Perseus Digital Library 19th-Century American Collection. Library Assessment Conference: Building Effective, Sustainable, Practical Assessment, 25 - 27 September 2006, Charlottesville, Virginia, USA. Call for papers. The submission deadline is 15 April 2006. Harnessing the Power of Grey: Eighth International Conference on Grey Literature, 4 - 5 December 2006, New Orleans, Louisiana USA. Call for papers. The abstract submission deadline is 1 May 2006.
International Conference on Digital Libraries (ICDL 2006), 5 - 8 December 2006, New Delhi, India. Call for papers. The submission date is 1 May 2006.
International Conference on Multidisciplinary Information Sciences and Technologies, InSciT2006, 25 - 28 October 2006, Mérida, Spain. Call for papers. The submission date for abstracts is 1 May 2006. Bringing Text Alive: The Future of Scholarship, Pedagogy, and Electronic Publication, 14 - 17 September 2006, Ann Arbor, Michigan, USA. Call for papers. The submission date is 15 May 2006. IADIS Virtual Multi Conference on Computer Science and Information Systems, 15 - 19 May 2006. This is a virtual conference available via the Internet.